Happy Feast day St. Vincent Ferrer! 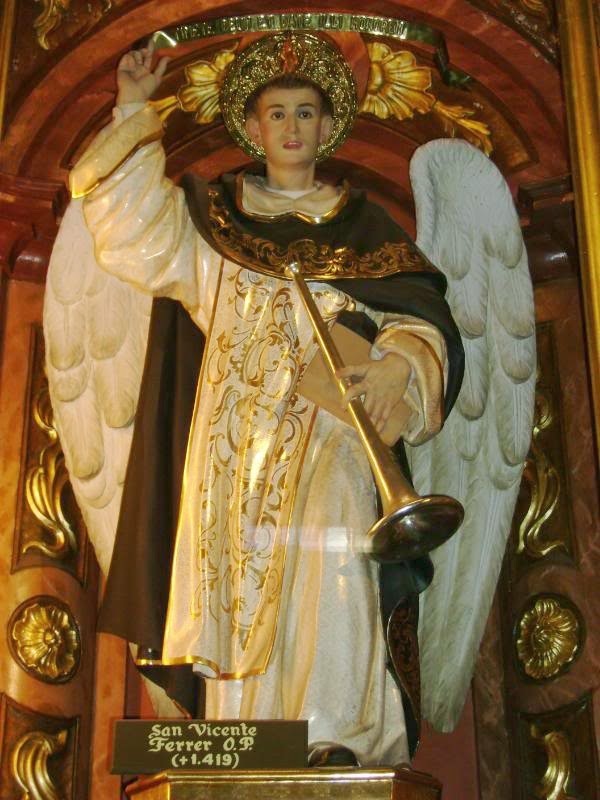 St Vincent Ferrer has 2 distinct physical characteristics: the wings and the burnt cheek. The wings signifies of him being an angel, an Angel of the Last judgement. The burnt cheek signifies the healing when he was in the verge of dying from fever. There are also other symbols like open book as a preacher and trumpet. Since it is the feast day of one of our Patron in the community, the reflection is about the life of St. Vincent Ferrer. The reflection of the soon-to-be-deacon made me reflect on my previous actions. The question was "How do I want to be remembered as a Saint?" (Paano ko gustong maalala ako bilang isang santo?). A few days ago, I did googled if there were saints with my name, "Saint Beryl." I found one and I am not sure if it is real since it says there, "The Legend of Saint Beryl." As the brother continued his story about his sainthood reflection, I remembered things that I really used to love to do: planting, butterfly breeding, and environment. Being a patron saint for any of those has been given all to St. Francis of Assisi. Why not be more specific? I do not really breed for any kind of butterfly. There is only one breed - Tiger Monarch. Saint Beryl, Patron Saint of Tiger Monarch. My statue would be pretty while I hold a sunflower with the Tiger Monarch on it.